A Word a Week Challenge: Metallic | Oh, the Places We See . . . When I saw the Word a Week Challenge for this week with the word METALLIC, I remembered something that caught my eye this past January. I was driving from the Las Vegas Strip on I-15 to a school in Clark County, Nevada, one morning when the sun glinted off a building near the World Market Center. Of course, I didn’t get a good look at it, but I thought it resembled the undulating curves of a Gehry building. After work that day, I returned and exited onto Bonneville Avenue. There it was. It had to be a Gehry! 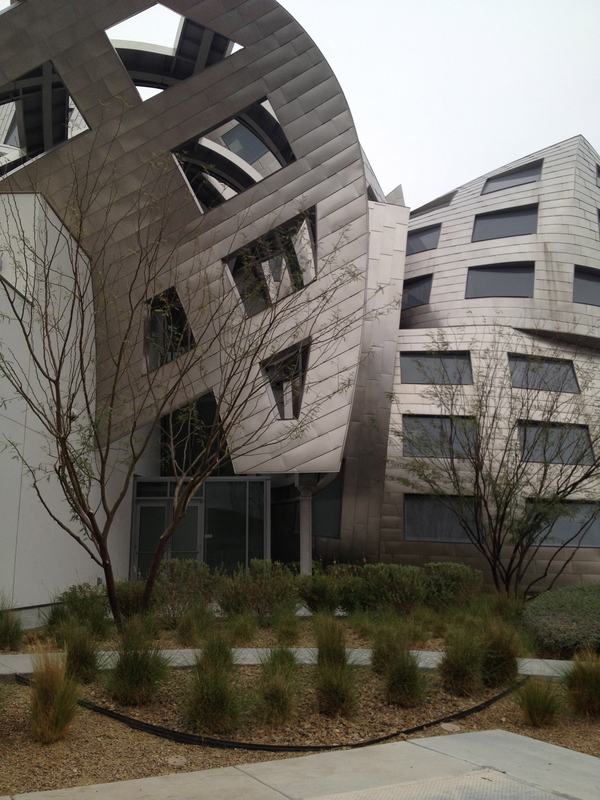 Sure enough, I walked around and discovered the Lou Ruvo Center for Brain Health. The unmistakeable shiny metal forms swerving, curving, caressing whatever lay inside were indicative of the architecture of Frank Gehry, designer of the Walt Disney Concert Hall in Los Angeles; the Guggenheim Museum in Bilbao, Spain; and the Experience Music Project in Seattle — all with that characteristic metallic motion and form. Later, I read an article from the Los Angeles Times by Christopher Hawthorne dated May 19, 2010 (Click here) who added this information. 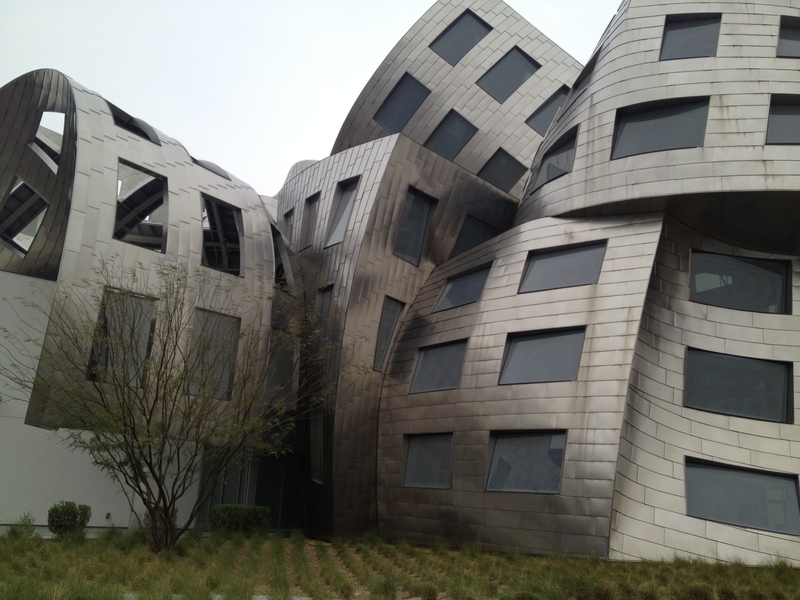 Gehry had become friends with Lou Ruvo, a Vegas liquor distributor, whose father had struggled with Alzheimer’s. 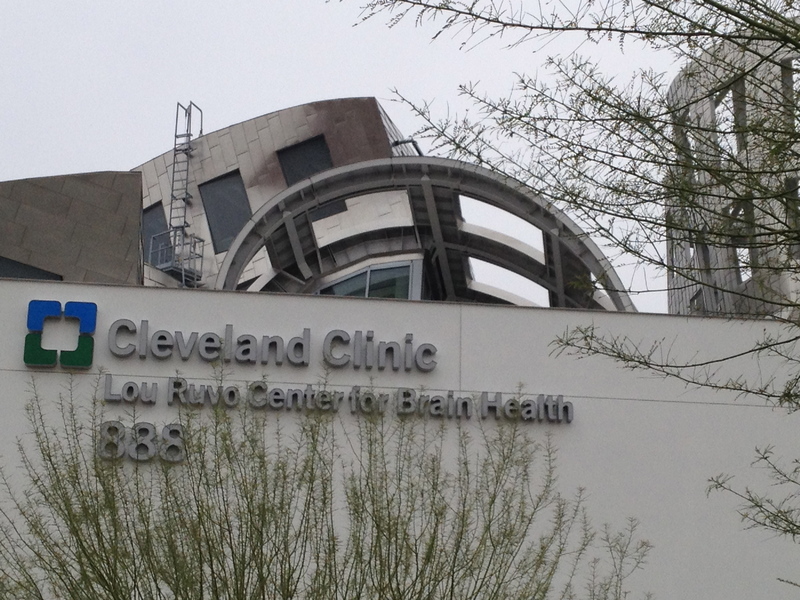 Ruvo wanted Gehry to design a neurological research center for the treatment of brain disorders such as Alzheimer’s and Parkinson’s. Gehry agreed but only if the center would also include research/treatment for Huntington’s disease since Gehry’s longtime friend and analyst, Milton Wexler, had seen his own wife and three sisters-in-law suffer with Huntington’s. And so it is that this $100 million center came to be — with its seemingly movable walls and bending metal layers that reflect the Nevada sun artfully. Although I could not go in, I was able to snap these pictures. And I also noticed a sculpture in the rear enclosed area that bears Gehry’s name. Perhaps it was a gift of the architect. Does anyone know? I’d love to return on a sunny day so as to capture that same metal gleam that caught my eye the morning I drove to work. But for now, I just smile knowing I’ve checked off seeing another Gehry! 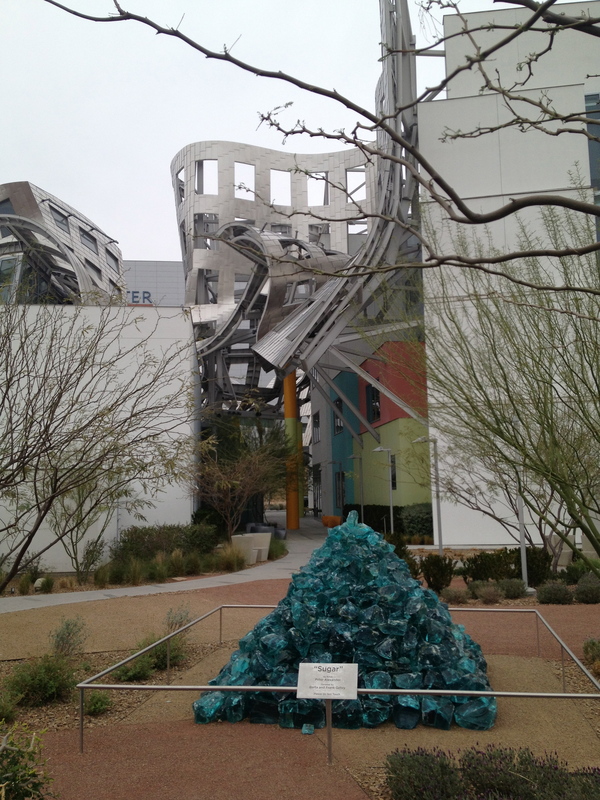 This entry was posted in A Word a Week Challenge, Nevada and tagged Alzheimer's, art, Cleveland Clinic, Frank Gehry, Huntington's, Las Vegas, Lou Ruvo, Milton Wexler. Bookmark the permalink. 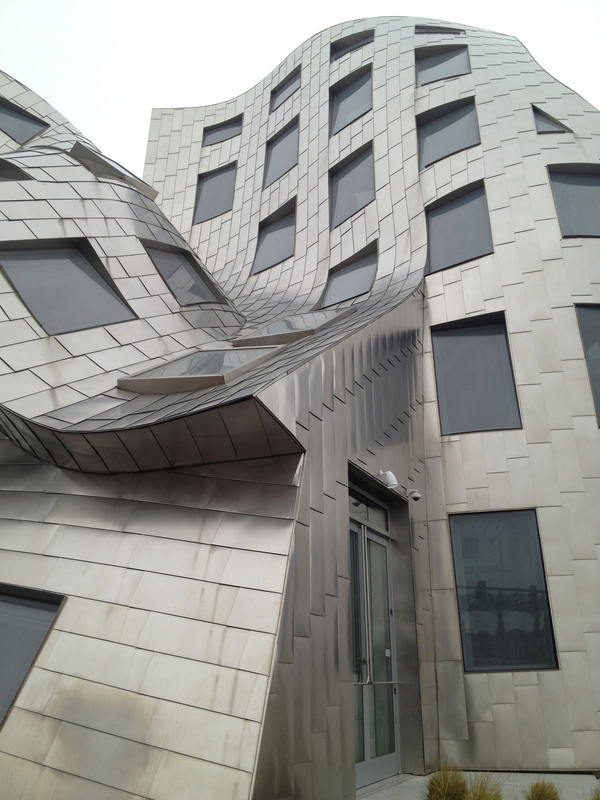 That is one crazy looking building… great pics! Amazing! I cant wrap my head around how someone would conceive of, let alone build, something like this!! Me neither!!! I’ve seen three of his buildings in the U.S., but none of the ones in other parts of the world. Would also like to see them inside!! Thanks for commenting! Odd. This is the second time I’ve seen pics of that building this week. And I’ve never seen or heard of it before. I think it is the coolest thing. Thanks, Rusha. I’ve now seen 3 Gehry buildings. Wouldn’t it be fun to see the one in Spain!!!! Beautiful building, and we get an education to go along with the pretty pictures. Very interesting, thanks! You’re so welcome. I guess I do brake for architecture!!! Wow that is an amazing building! There’s a tall condo building in NYC i kept seeing and later discovered it too is a Gehry. It looks like someone put their hand around it in the middle and crumpled it a little. I loved it! Love your phrase — put their hand around it in the middle and crumpled it a little!!! Would love to see that building in NYC. I’ve only seen 3 Gehry buildings all together!! Thanks for commenting! Wow! Great photos, hope you get back there on a sunny day too! !